Accounting and Tax Form Downloads | Arlington Heights IL Accounting Resources | Claremont Management Corp.
Just click on form title below to download in PDF format. FREE CLIENT ORGANIZER (PDF Format) - Get a jump start on filing your 2018 taxes with our handy Client Organizer! In addition to providing a convenient tax document checklist, it asks a series of easy "Yes" or "No" questions that will help us identify various factors that will affect your tax liability as well as tax-saving deductions to which you may be entitled. 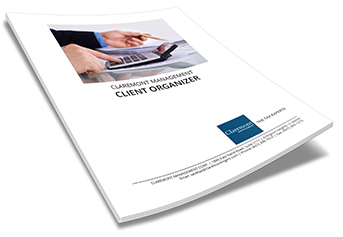 Existing Claremont Management clients receive a personalized version of this organizer annually. FORM SS-4, APPLICATION FOR EMPLOYER IDENTIFICATION NUMBER (EIN) - Use this form to apply for an employer identification number (EIN). An EIN is a nine-digit number (for example, 12-3456789) assigned to employers, sole proprietors, corporations, partnerships, estates, trusts, certain individuals, and other entities for tax filing and reporting purposes. FORM W-9, REQUEST FOR TAXPAYER IDENTIFICATION NUMBER (TIN) AND CERTIFICATION - Use this form to provide your correct TIN to the person who is required to file an information return with the IRS to report, for example, income paid to you, real estate transactions, mortgage interest you paid, acquisition or abandonment of secured property, cancellation of debt, or contributions you made to an IRA. This form should also be issued to subcontractors, as well as to all payees for any legal (attorneys) and/or rent payments (landlords) totaling over $600 (for business purposes). I-9, EMPLOYMENT ELIGIBILITY VERIFICATION - Form I-9 is used for verifying the identity and employment authorization of individuals hired for employment in the United States. All U.S. employers must ensure proper completion of Form I-9 for each individual they hire for employment in the United States. This includes citizens and noncitizens. Both employees and employers (or authorized representatives of the employer) must complete the form. On the form, an employee must attest to his or her employment authorization. The employee must also present his or her employer with acceptable documents evidencing identity and employment authorization. The employer must examine the employment eligibility and identity document(s) an employee presents to determine whether the document(s) reasonably appear to be genuine and to relate to the employee and record the document information on the Form I-9. The list of acceptable documents can be found on the last page of the form. Employers must retain Form I-9 for a designated period and make it available for inspection by authorized government officers. NOTE: State agencies may use Form I-9. Also, some agricultural recruiters and referrers for a fee may be required to use Form I-9. WITHHOLDING EXEMPTIONS - PERSONAL EXEMPTIONS - FORM W-4 - The amount of wages subject to graduated withholding may be reduced by the personal exemption amount. The personal exemptions allowed in figuring wages subject to graduated withholding are the same as those discussed under Figuring Your Tax, except that an employee must claim them on Form W-4, Employee's Withholding Allowance Certificate. Refer to Publication 505, Tax Withholding and Estimated Tax, for the current personal exemption amount.